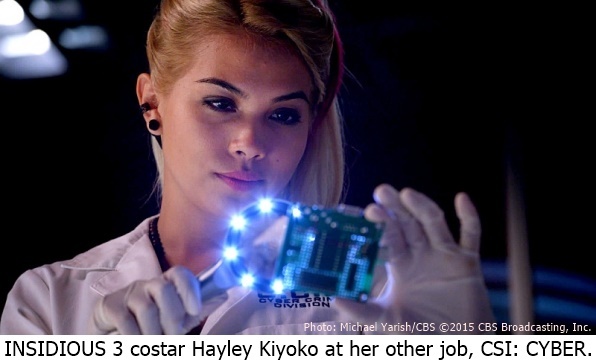 Hayley Kiyoko is having a busy 2015. In February, the 24-year-old actor and singer/musician released an EP, This Side of Paradise, in February. In October, she’ll be seen as Aja in Jem and the Holograms, a live-action adaptation of a beloved 1980s cartoon series. She also plays a former black-hat hacker turned hacker for the FBI on the CBS series CSI: Cyber, starring opposite Oscar winner Patricia Arquette. Currently, she can be seen on movie screens as the best friend of a teenager stalked by demons in Insidious: Chapter 3. It was that horror thriller that brought her to San Francisco along with the “Into the Further 4D Experience,” a virtual reality/oculus rift haunted house installed on the grounds of a Mission district high school for Carnival weekend. Q: How did the Insidious 3 script strike you when you first read it? Q: You’re a musician as well an actor. Which came first? HK: Music was always the first thing, but music, as anyone knows, is such a long journey. You’re constantly trying to find your sound sonically, and so now I’m finally where I want to be, as well as now the acting thing is blowing up. It’s really cool. They’re kind of surfacing together. I was a drummer since I was little, so I’m very into rhythm. I’m doing a tour on the East Coast this summer, which will be really fun. I love playing music. I’m always doing that when I’m not acting. Q: When did you know that you wanted to do both? HK: I never planned on being an actress. When I was little, I planned on being a performer, whatever that was, whether it was a dancer or a drummer or a singer. I knew I wanted to perform. The acting thing happened through music. I would do commercials playing guitar, doing music stuff, and then it just evolved and I started building my resume. Then I took a shot in the dark and got a great offer to do a movie, Scooby-Doo, way back when. That started the bug of loving to act. It was so different and it was such a challenge. I’d done musical theater when I was younger and stuff. It’s such a different way of performing and exuding that artistic expression from music. Q: You’re also a regular on CSI: Cyber. HK: I’ve never really had such a steady job as a network show before, so I’m looking forward to the challenge. I’m actually kind of nervous. It’s just such a long thing, that I’m very excited. And my character is fun. And I’m working with a Golden Globe/Oscar winner, that’s kind of cool. That’s a plus. Q: You’re Aja in this fall’s Jem and the Holograms movie. Can you tell me about it? HK: It’s crazy hair and makeup and wardrobe. It’s not a remake of the cartoon. It’s definitely just inspired by the cartoon and placed in a modern time. It’s going to be great for the new Jem fans. It’s really geared toward the new generation, but I think old Jem fans will really enjoy it. The trailer’s out and they’re all going, ‘It doesn’t have this and this and this.’ Well, you’re going to have to see the movie. Don’t be too scared. Go check it out.